The Teen Appeal is a citywide high school newspaper produced by the students of Shelby County Schools. It is supported by a generous grant from the Scripps Howard Foundation. The University of Memphis hosts and administers the program, hosting an annual week-long summer journalism camp as well as monthly staff meetings. Our print edition is printed and distributed by The Commercial Appeal. The 2015 Lionel Linder Journalism Camp was held August 3-7. 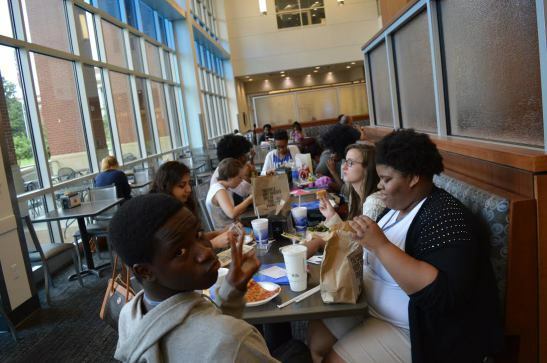 At the 2015 Teen Appeal camp, student staffers eat lunch in the University of Memphis’ University Center. 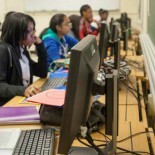 Now in its 18th year, The Teen Appeal has a mission to recruit minorities into the nation’s newsrooms by introducing them to journalism during high school. Before its inception, the opportunity to work on a school newspaper did not exist for most Memphis high school students, especially those in majority African-American high schools. The Teen Appeal helps high school students develop skills in writing, interviewing, and multimedia production that are vital to their future success not only in journalism, but in life. Through their interaction with professionals, including many of our own alumni, Teen Appeal staffers develop role models and an appreciation for the power and importance of journalism in a democratic society. Our students have interviewed local news-makers from the school superintendent to the city mayor and have covered major stories such as President Obama’s visit to Memphis high school Booker T. Washington and the controversial school consolidation plan that rocked the county in 2011, as well as lighter fare such as prom fashions and poetry slams. Teen Appeal alumni have gone on to become journalists, attorneys, public relations practitioners, educators, playwrights and authors, in addition to a myriad of other careers. Students attending high schools in the Shelby County Schools system are eligible to become staff members. Recruitment takes place in the spring of each school year, but students are accepted year-round. To apply, schedule a school visit, or for any additional questions contact The Teen Appeal via phone at (901) 678-4710 or by e-mail.